Soldier T-shirt Fabric density fabric material used in the production amount and indirectly, determines the thickness of the fabric. Soldier T-shirt color fastness (light and exposure to atmospheric conditions common) air washing and rubbing are tested. Color fastness is assessed visually by comparison between the test sample with standard samples. 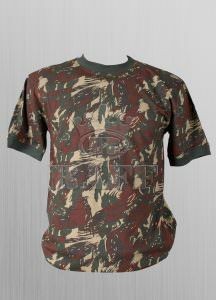 Soldier T-shirts are 100% cotton fabric 120-140-150-160-180 gr / m2 camouflage pattern round neck with a hat hat is made as long and short sleeve. Soldier camouflage pattern fabric military training suits, military uniforms, military t-shirt is made of production in the same pattern used in military uniforms.